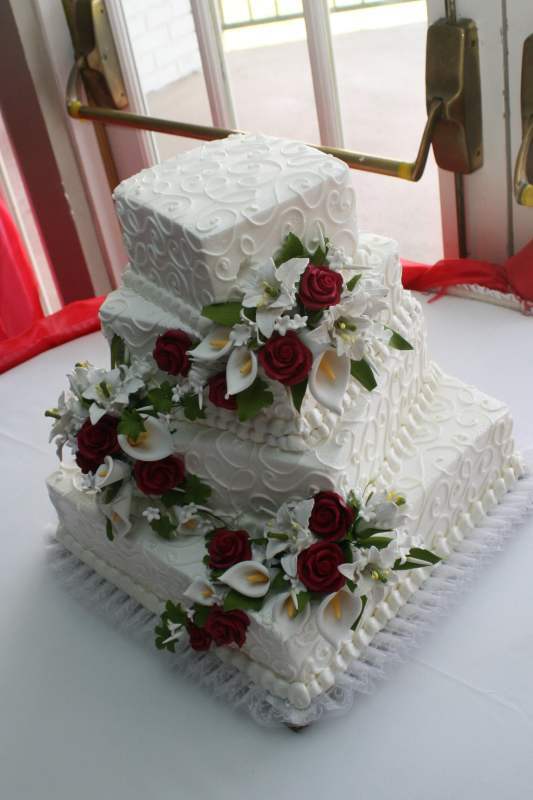 Are you shopping around for wedding cakes in the Chino Hills area? We hope you will come check out our family-owned bakery, where we will give you the personalized attention you deserve. Please browse our website and Pinterest for wedding cake ideas. We are happy to accommodate your wishes. The cake you see here is covered in piped scrollwork and hand-sculpted roses and calla lilies. We made it in a tiered square design, which lends a modern sophistication. Instead of tiering the cakes square, however, we off-set them, which gives the cake a different, slightly more playful feel than lining up the angles. If you wanted an even more whimsical feel, you might go with a topsy-turvy cake design. But this cake blends some traditional wedding cake elements with a touch of personal style that has both a fresh and timeless appeal.